Just when I thought I’d seen every way imaginable to mix music and gaming, along comes Mad Fellows’ Aaero, in which players trace beams of musical energy through beautiful and deadly environments. 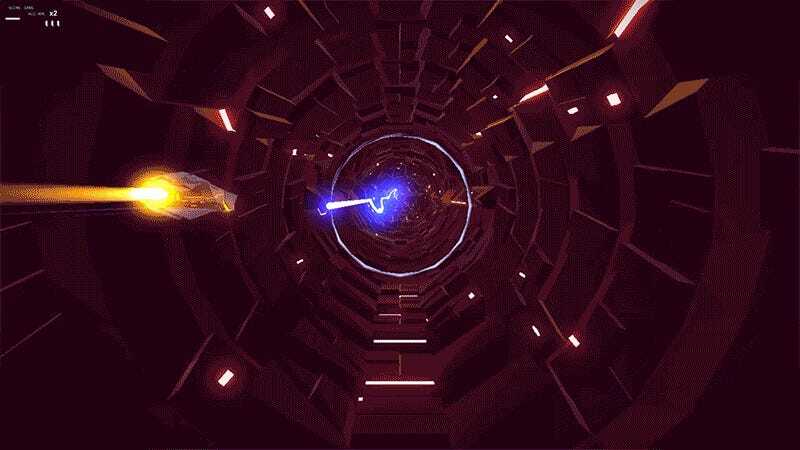 Aaero came to my attention yesterday evening, after our managing editor, Riley MacLeod, sent me the following message: “Yo I’m playing this new rhythm game Aaero and you should check it out!” So I checked it out, fell in love, and figured I would pass the word along. Aaero sees players navigating through alien environments in a futuristic flying craft. As the music plays, ribbons of light bend and twist in the air, visualizing aspects of the song. Sometimes it’s vocals. Sometimes it’s strange electronic wails. Using the left analog stick (required even in the PC version), players must grind against those ribbons in order to absorb the energy of the music. The game’s tunnel-like environments warp and twist to impede the player, each new level bringing unique obstacles and traps into play. Odd mechanical enemies attack from time to time, with the game employing a target lock and fire mechanic using a combination of right analog and trigger. Here’s the description from Steam, where the game is now on sale for $11.99. Speed through stunning, stylised environments tracing ribbons of light, releasing the energy in the music. Battle strange enemies and fight epic boss battles all driven by an incredible licensed soundtrack. Independent micro-studio ‘Mad Fellows’ brings you a unique and innovative game featuring music from Noisia, Flux Pavilion, Katy B, The Prototypes, Neosignal and many more. Aaero has a bit of a learning curve, as most music-based action games do. Players need to know the music before they can flow with the music. Once they can, it’s an exhilarating experience. Here’s the very first song players encounter in the game, “Bass Cannon,” which is exactly what it sounds like. Maybe grab some headphones. Aaero is now available on PC, Xbox One and PlayStation 4.